Having mold growing in your home can be a serious problem. It can cause discomfort and health issues and threaten your home’s structure. The only way to get rid of mold in your home is to know how to spot the signs of mold and then determine the severity of the problem. To prevent illness, it is important to recognize the signs of mold and get rid of mold in your home. The most obvious sign is visual. If you see black, green, or white patches on the ceiling or walls then you are probably looking at mold. Water stains that look like brown rings on the ceiling are also warning signs of water damage which welcomes mold growth. One or more household members are often sick. You may notice that when they leave the home, their symptoms get better and continue to get better the longer they are away from the home. This is a big indicator that there could be a mold problem in your home. Get rid of mold and chances are your family’s health will improve. You may notice a musty smell in your home. A large amount of mold has a musty-like smell that can quickly spread throughout the home. This is due to the microbial volatile organic compound (MVOC), an odorless gas that mold produces. If there is a leak or spill that hasn’t dried within 24-48 hours, expect mold to grow. 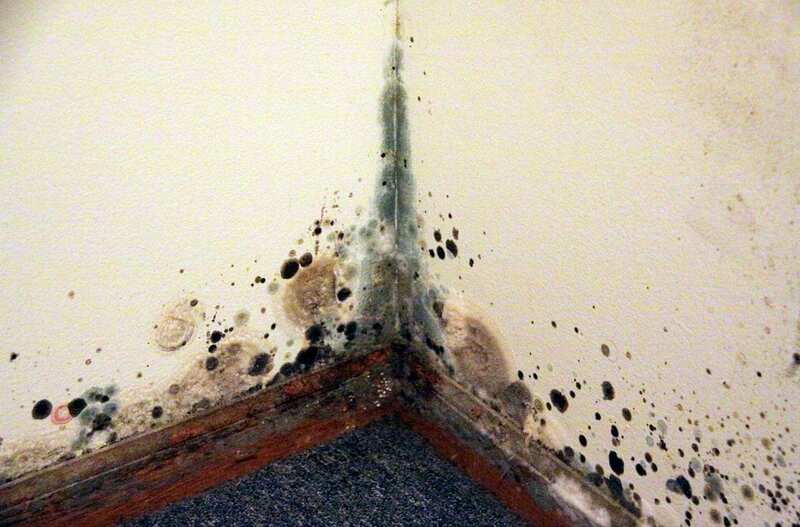 Mold needs moisture to survive so somewhere near a leak is a great place for it to thrive. Mold can also begin to grow in the air and then settle on surfaces if your home is humid. The most common places that mold grows in the home are in the kitchen, bathroom, and basement due to the water sources and often higher humidity levels. Getting rid of mold can be fairly simple if you catch it early enough. Keeping it from coming back is a different story. To get rid of mold in the early stages, you simply scrub it away. You will want to use a face mask to prevent inhaling the spores. You may purchase special mold-removing cleaner at a hardware store or you can use bleach to sanitize the area (make sure the bleach won’t stain or discolor the area first). If black mold has set in or if the mold has gotten deeper than just the surface, you should bring in a mold remediation professional to remove the mold safely and establish a plan to keep it from reemerging. In order to discover the degree of your mold problem, it is best to have a professional mold inspector come to your home and pinpoint the location and intensity of the mold growth. They can recommend a plan for removal and prevention. Preventing mold takes effort. Make sure you keep your home dry. Fix any leaks quickly and try not to leave water standing, especially in places like showers, basements, or the kitchen. Your home should be well ventilated so that it doesn’t become humid and encourage mold growth. If you are building a home or remodeling, let the framing dry before putting up drywall. You don’t want mold to start growing before you even finish building the house. Use mold-resistant materials during any new construction. In summary, keep your home dry and use a dehumidifier to remove excess moisture from the air, and you will discourage mold growth. This will make your home safer, healthier, and more comfortable for you and your family. Inspect It Neil Home Inspections provides mold inspections for all of New Jersey. If you suspect a mold issue in your home, contact us today!